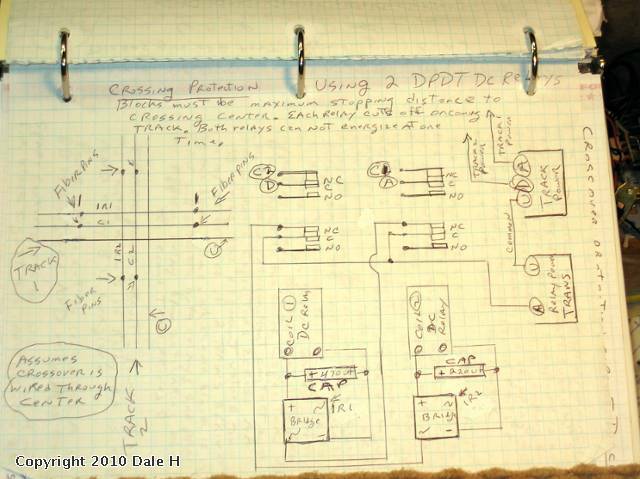 This circuit uses 2 DPDT relays. Coil activation is by the insulated rail method. Although mostly done in conventional I have made circuits that worked for 2 trolleys using DCS. The relays are wired so that each relay cuts power to the opposing track isolated center rail using 1 set of contacts per relay. A second set is used so that both relays can not energize at once. Each coil is in series to the opposing relay's NC contacts. Not shown in drawing but a 3rd set of contacts can be used so pickup rollers do not bridge the center rail. This would involve making another insulated center rail behind the first insulated center rail. This would require 2, 3PDT relays. The capacitors on the coils eliminate chatter and the different value capacitors provide a tie breaker if the trains reach the crossing at exactly the same time. The cost to make this circuit would cost about $20 for parts. Please see my relay post for relay configuration details and explanation of activating relays with the outside insulated rail method.. I believe I have all the parts for the cross over protection. This is the next project on my honey do list. I would like a printable copy of your plan please. It was a little easier answering you on the below link. I can make the print larger. Copy and paste this address and it should go there. This JC sight does not seem to allow direct links. Feel free to Email me also. Thank you so much, I got the larger copy and was able to print it.